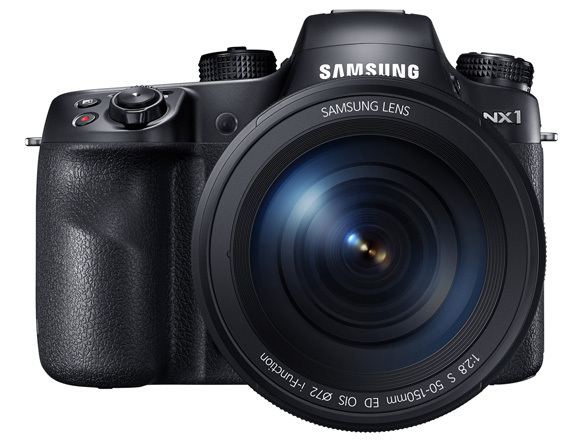 Samsung NX1 review: Hail the new king of APS-C hybrids! Combined with its impressive tech specs, Samsung’s NX1 offers a DSLR design that includes a large handgrip, optional vertical handgrip, and LCD top plate for improved hybrid handling. Since its release,Samsung’s NX1 has caused lots of ripples in the hybrid camera pond thanks to its impressive array of features. Foremost among these is its 28.2Mp APS-C chip that makes the NX1 the highest resolution “crop sensor” hybrid currently available. It’s also the first hybrid to utilise BSI (“Backside Illuminated”) sensor technology for enhanced image quality. By essentially turning the sensor over, light reaches the photoreceptors more efficiently than with conventional sensors. 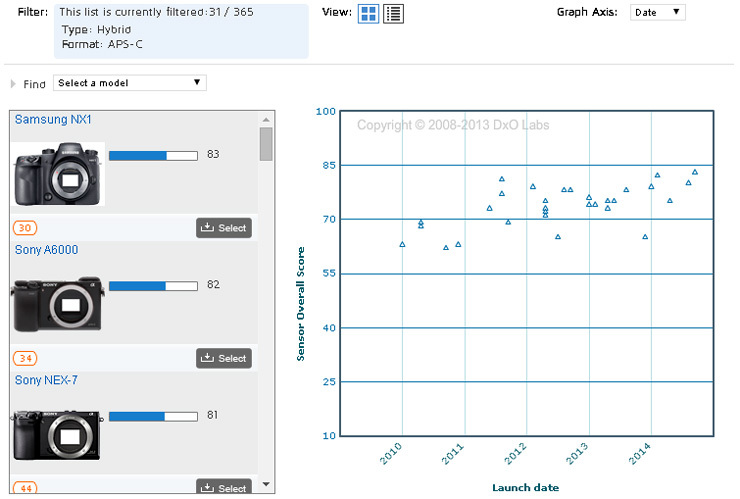 So in theory BSI sensors record better light quality and thus superior images. 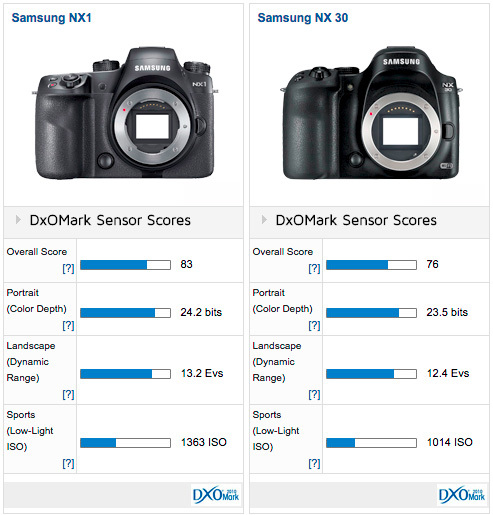 With an overall Sensor Score of 83, the Samsung NX1 becomes the top-ranking crop sensor hybrid in the DxOMark database. Just 1 point ahead of the previous leader — the Sony a6000 with 82-points — the NX1 also ranks fifth for all hybrid cameras, just behind the full-frame Sony A7 models. Its Portrait Score of 24.2 bits offers the best Color Depth for crop sensor hybrids, again just fractionally ahead of the Sony Alpha APS-C models. Its Color Depth isn’t quite up there with the results from Sony’s full-frame hybrids, however, which offer around 1 stop better color for scores over 25 bits. In terms of its Landscape score, the NX1 only barely drops into second place for APS-C hybrids behind the A6000. That said, its score of 13.2EVs puts it essentially on par with the recent Sony APS-C competition, with all Dynamic Range scores hovering around the 13EVs mark. In fact, the NX1 actually matches the Dynamic Range results of the full-frame Sony A7S hybrid, also with 13.2EVs, but it’s a result that’s around oine stop behind the best hybrid Landscape scores for the Sony A7 and A7r. 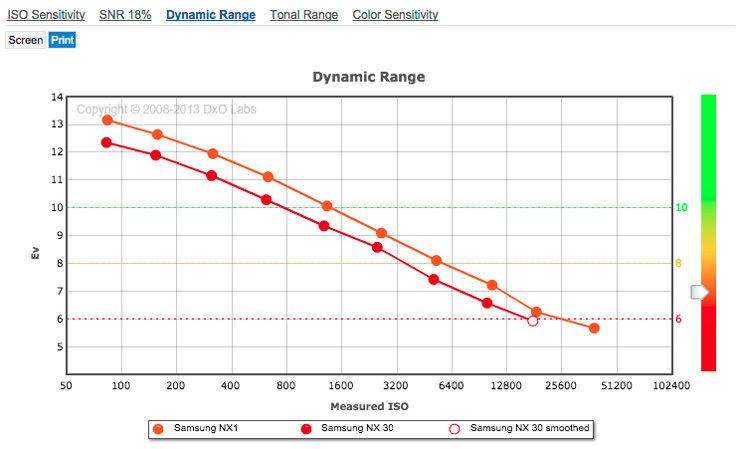 Finally, the NX1 also tops the charts for Low-light ISO for crop sensor hybrids with a score of ISO 1363. Again, its results against the APS-C hybrid Sony competition are all in the same ballpark, so it’s only when you step up to the larger full-frame sensors that you start to see a significant difference. For example, the Sony A series offer around one stop better low-light ISO performance, with Sports scores of 3702 ISO for the A7S compared to 1363 ISO for the NX1. With 83 points, the BSI sensor in the NX1 becomes the highest-ranked hybrid crop sensor we’ve tested, knocking the Sony a6000 down into second place despite very close scores. 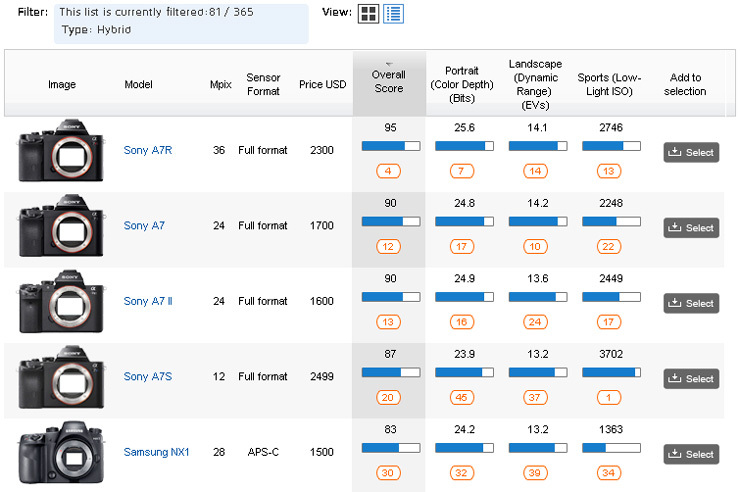 Against all hybrid cameras, including the full-frame Sony A7 series, the NX1 ranks in fifth place overall, with the 28.2Mp BSI sensor scores only a shade behind those of the Sony A7S. Going head-to-head against the previous best Samsung hybrid sensor in the NX30, the NX1’s new BSI sensor offers around one-half stop improvement overall. The margin of improvement is slightly greater for Dynamic Range, however, where Landscape scores of 13.2EVs vs 12.4EVs for the NX30 equate to roughly 2/3 stop at base ISO. As sensitivity is increased, Dynamic Range on both cameras decreases, but the rate of decline follows similar path, with the NX1 maintaining that 2/3 stop advantage. — That’s with the exception of the top sensitivity, however, where the NX 30’s “smoothed” results give it a boost for Dynamic Range and bring it closer to the NX1’s results at ISO 25,600. 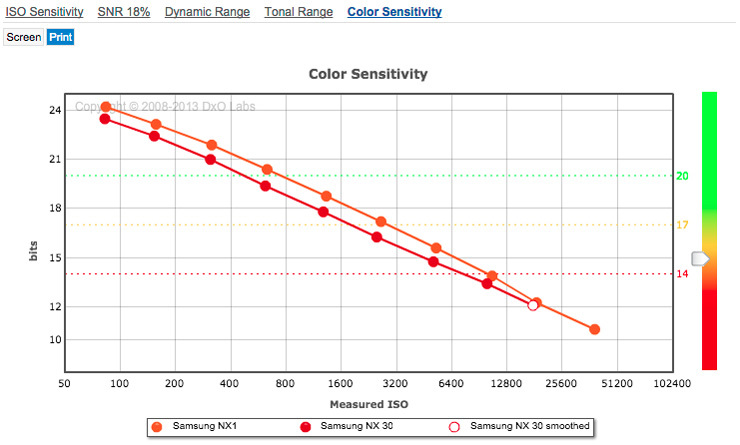 It’s a similar pattern for Color Sensitivity, with comparable results for the NX1 and the NX30 throughout the ISO range, although not exactly the same. The NX1 maintains its color advantage at ISO 100/200, with just a slight increase in the margin between ISO400 to ISO3200. Again, the NX 30’s “smoothed” results at ISO 25,600 give its Color Sensitivity a boost and bring it close to the NX1, but the NX30 doesn’t offer better color than the NX1’s native results. For Low-light scores, however, the difference between the two Samsung models is less pronounced, with scores of 1363 ISO for the NX1 vs 1014 ISO for the NX30, close to a 1/3 stop difference. 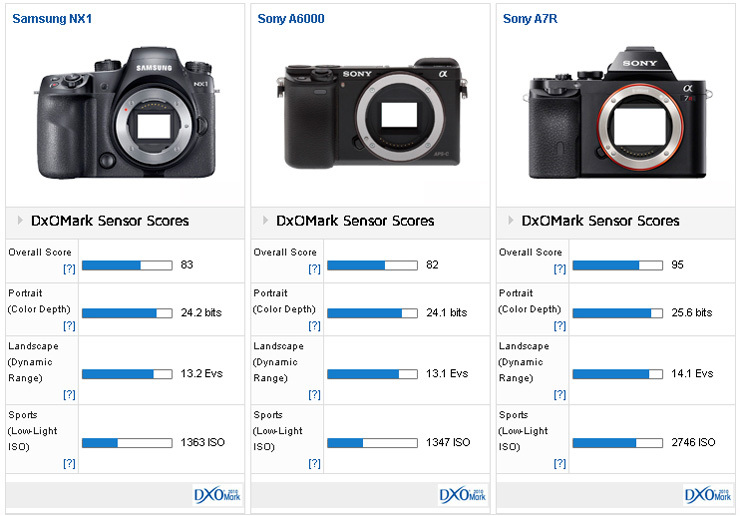 All NX1 sub-scores offer a very modest improvement over the pervious highest-scoring hybrid APS-C sensor in the Sony A6000. There’s really nothing between them for image quality, so your purchasing decision really boils down to handling and whether you prefer the NX1 DSLR style or the more compact design of the A6000. For that step up in image quality, the full-frame Sony A7R is still the hybrid camera to beat. It boasts a beefier resolution than the NX1, 36Mp compared to 28.2Mp, and offers almost one stop better image quality overall (95 points vs 83 points). At base ISO, the A7R’s Dynamic Range score of 14.1EVs compared to the NX1’s 13.2EVs is a one-stop advantage for the hybrid landscape photographer. The A7R offers one stop better color, too, 25.6 bits vs 24.2 bits, but it’s not quite as far ahead for Low-light ISO, with scores of 2746 ISO for the A7R vs 1363 ISO (equating to around 2/3 stop). Interestingly, the NX1 and Sony A7R are sold at a similar price point, too, with both cameras costing around $2,400, including a standard zoom lens. The Samsung NX1 does come with a “fast” aperture 16-50mm f/2-2.8 lens for that price, however, which is a bonus compared to the slower-aperture FE 28-70mm f/3.5-5.6 on the A7R, which will to some degree mitigate the Sony’s better Low-light ISO score. The new sensor in the NX1 has upped the stakes in terms of hybrid image quality, making Samsung’s latest hybrid the current king of mirrorless APS-C cameras in our database. The BSI sensor is not only the physically largest sensor of its type, but boasting a 28.2 million pixels, it’s also the highest-resolution APS-C hybrid currently available. 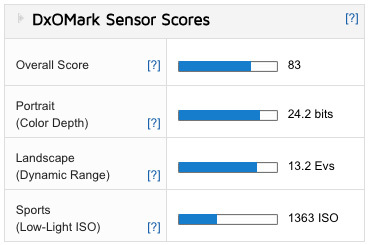 With an overall DxOMark Sensor Score of 83 points, the NX1 knocks our previous APS-C hybrid champion, the Sony A6000, down into second place with 82 points. As we’ve also seen with the impressive image quality results from the latest APS-C sensor in the Nikon D7200, the NX1’s smaller chip offers image quality close to that of full-frame sensors. It’s not quite as good, but still, being just one stop behind in all categories against models such as the Sony A7R, the image quality on the NX1 is impressive. Add to that high-caliber features such as the 205-point autofocus system and 15fps burst shooting, and the NX1 is an attractive-looking proposition. The slightly bulkier design, not to mention the hefty $2400 price tag, will put off some consumers. For the more discerning enthusiast, however, the DSLR-style body, larger handgrip, optional vertical handgrip, external controls, and great image quality will certainly appeal.